Apparently all Wall Street needed to end its panic attack was a little money printing talk. U.S. stocks ended another wild day of trading mostly unchanged, rebounding from an early 200-point plunge on the Dow that was sparked by fears of a global slowdown. The big comeback was triggered by a Federal Reserve official who suggested the central bank could abandon its plan to pull away the easy money punch bowl that's been juicing stock prices for years. "The market loves free money. If the Fed wants to print it, we go higher. Don't fight it," said Joe Saluzzi, co-head of trading at Themis Trading. Fed officials are clearly taking notice of the extreme turbulence that has hit the markets in recent days due to fears about Europe's economy, the Ebola outbreak and plunging oil prices. Just look at Wednesday, when the Dow plummeted as much as 460 points but ended the day down "only" 173 points. The wave of selling over the past month has left all three major indexes flirting with their first "correction" in years. The Nasdaq briefly hit correction territory on Thursday, signaling a 10% decline from a previous closing high. But it's since bounced back from those levels. 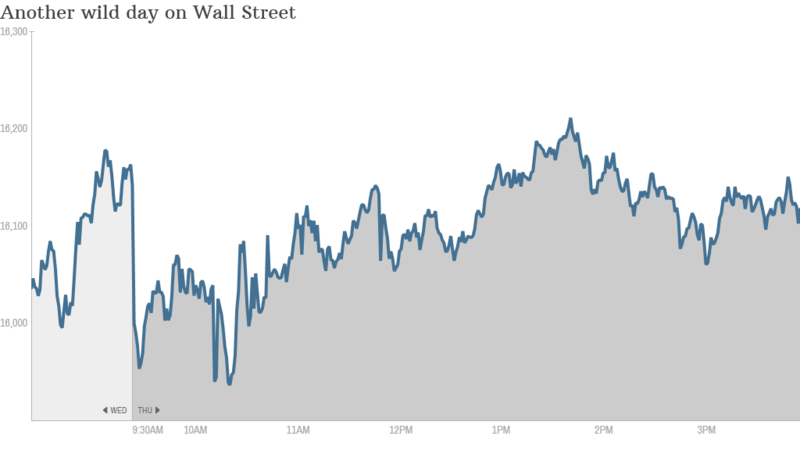 Despite closing off its lows, the Dow did fall 25 points Thursday. That means it's closed lower for six days in a row for the first time since August 2013. The S&P 500 ended virtually unchanged. Fed to the rescue? The bulls on Wall Street launched their comeback after James Bullard, president of the St. Louis Fed, told Bloomberg News the Fed should weigh delaying the end to quantitative easing, or QE. The bond-buying experiment that has helped send stocks to record highs and had been poised to end this month. A decision by the Fed to keep the program going would represent a big 180 and a positive for stocks and other risky assets that have benefited from the stimulus. "This big flip flop from the guy I refer to as 'the Godfather of QE' is a game changer," Michael Block, chief strategist at Rhino Trading Partners, wrote in a note to clients. "This is a powerful signal that the Fed remains accommodative and is concerned with asset prices and volatility enough to consider the seemingly unthinkable step of continuing and even growing QE from current levels." Wall Street will be listening very closely to Fed chief Janet Yellen's speech Friday morning. Signs that she is worried about the recent economic developments could give stocks a further boost. Related: Has the Fed run out of ammo? Not all gloom & doom: Besides more magic from the Fed, stocks received support from a number of positive U.S. data points. There's fresh evidence the job market is getting healthier. Claims for first-time unemployment benefits tumbled last week to the lowest level since April 2000. "I think it speaks loudly about the sturdiness of the labor market. That's the underpinning of a self-sustaining economic recovery," said Mark Luschini, chief investment strategist at Janney Montgomery Scott. The better economic headlines may have helped boost crude oil, which took a break from its month-long plunge to close over 1% higher. That was good news for the beaten-down energy sector of the stock market, which was actually the best performer on the day. So was a $5.4 billion sale of wells by Chesapeake Energy (CHK), which surged 17%. Also, a number of major companies reported quarterly earnings that exceeded expectations. Shares of Delta Air Line (DAL)s and UnitedHealth (UNH) rallied on their earnings beats. Delta soothed Ebola jitters by saying it's not seeing a drop in demand due to the deadly virus. European jitters persist: The early selloff was fueled by more worries about European growth, which has slowed to a near halt. Some countries, including even economic powerhouse Germany, are teetering on the brink of recession. Markets in France and Germany retreated and the U.K.'s FTSE 100 tumbled nearly 3%. Virtually all European markets are now in correction territory. New problems are also emerging in the high-debt nations on Europe's periphery. Greece's stock and bond markets have been in free fall this week and Spain held a bond auction that failed to meet its target.